Western Express © 1986 Data East Corp.
A beat'em up / platform game with shoot'em up sequence. 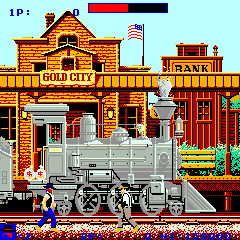 Western Express was released in January 1986, this game is known in US as "Express Raider". Gary Hatt holds the official record for this game with 197,200 points.